In contrast to a previous analysis, a new study has shown that the distributions of (a) the global temperature anomaly by month since 1880 and (b) the solar flare index by day over a few solar cycles are fundamentally different. One feature the detrended data do have in common is self-similarity: the probability density functions are the same on different time scales, which means that neither can be described as Lévy walks. Image credit: Rypdal and Rypdal. (PhysOrg.com) -- The field of climate science is nothing if not complex, where a host of variables interact with each other in intricate ways to produce various changes. Just like any other area of science, climate science is far from being fully understood. As an example, a new study has discredited a previous hypothesis suggesting the existence of a link between solar flares and changes in the earth’s global temperature. The new study points out a few errors in the previous analysis, and concludes that the solar and climate records have very different properties that do not support the hypothesis of a sun-climate complexity linking. In a handful of studies published in Physical Review Letters between 2003 and 2008, a team from Duke University and the Army Research Office including Nicola Scafetta and Bruce West analyzed data that appeared to show that solar flares have a significant influence on global temperature. Solar flares, which are large explosions in the sun’s atmosphere that are powered by magnetic energy, vary in time from a few per month to several per day. Although solar flares occur near sunspots, their frequency variation occurs on a much shorter time scale than the 11-year sunspot cycle. 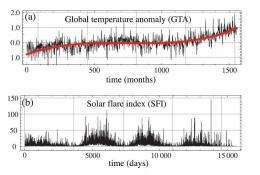 In their studies, the researchers’ results seemed to show that data from solar flare activity correlates with changes in the global temperature on a short time scale. Specifically, their analysis showed that the two time records can both be characterized by the same Lévy walk process. However, in the new study, which is also published in Physical Review Letters, Martin Rypdal and Kristoffer Rypdal of the University of Tromso in Norway have reexamined the data and the previous analysis and noticed some shortcomings. One of the biggest causes of concern is that the previous analysis did not account for larger trends in factors that affect solar flares and global temperature. For instance, the solar cycle has its 11-year periodic trend, where periods of lots of sunspots cause larger numbers of solar flares. Likewise, the global temperature anomaly has numerous other factors (a “multi-decadal, polynomial trend”) that impacts global temperature fluctuations. By not detrending this data, the analysis resulted in abnormally high values of certain variables that pointed to Lévy walk processes. By estimating the untrended data, Rypdal and Rypdal hypothesized that the solar flare records might be described by a Lévy flight, while the global temperature anomaly might obey a distribution called persistent fractional Brownian motion. As the researchers explain in their paper, the finding that the scaling behavior of both the solar flare activity and the global temperature remain self-similar for large changes in scale provides evidence that the data sets cannot be described as Lévy walks. The Norwegian researchers also noted that the previous analysis had errors beyond the lack of detrending. Most significantly, they found that the analysis could not distinguish between Lévy walks, Lévy flights and Gaussian processes such as fractional Brownian motion. For this reason, the analysis would have concluded that some other data sets were described by Lévy walks when they were not. To demonstrate, the Norwegian researchers created a fake data set from a fractional Brownian motion model with a trend. When they applied the previous analysis to this data, the analysis described the data as a Lévy walk. Last, the Norwegian researchers formulated a new analysis which could distinguish between these three different processes, and applied the analysis to the detrended solar flare data sets. The results revealed that the solar flare records actually follow a Lévy flight, as they had hypothesized. Also, by applying the analysis to detrended global temperature anomalies, the researchers found that the data is well described as persistent fractional Brownian motion, as they also hypothesized. As the researchers explain, the results provide more evidence to support the supposedly controversial theory of human-induced global warming. The guys at Realclimate.org have been saying this exact thing for awhile. This is old news. - Producing an increase in "greenhouse gas" levels. Solar flares are intermittent events, and were never considered to be a significant driver of long-term temperature variations. In their studies, the researchers’ results seemed to show that data from solar flare activity correlates with changes in the global temperature on a short time scale. Yes, but this result is being spun as another brick in the wall (my charitable act for the day) of AGW. And it isn't, because it never addressed anything but events that are too transient to affect climate (as opposed to weather). ..Although solar flares occur near sunspots, their frequency variation occurs on a much shorter time scale than the 11-year sunspot cycle. ..
With compare to flares, there is a tangible evidence of correlation of climatic cycles and periods of solar activity, as expressed by frequency of sunspots. In my opinion it's generated by Coriolis force, which is switching circulation beneath surface of Sun. The direction of this force is driven by location of center of mass of whole solar system, although the eleven years long period of Jupiter planet is most important there. Maybe ancient astrologers were quite right, while deriving the changes of climate and human psychics just from conjunctions of planets (wars for sources in particular). One question would be, what datasets did they use, raw or corrected? How many versions of the dataset, etc. Unfortunately aside from a flashy headline, that isn't accurate when describing the content, there is little actual content in this abstract. Wouldnt it have been nice if they could have shown the graphs on the same flippen time scale?? Would not have shown any correlation I dont think, but would have been a bit more professional. "Scientists find errors in hypothesis linking solar flares to global temperature." But scientists ignore errors in hypothesis linking global temperature to CO2! See: "Earth's heat source- The Sun", Energy & Environment 20 (2009) 131-144. Funny how the substitution a word "solar flare" instead of sun spots is used to influence readers. They can always claim they never lied and that would be true. We should rather ask "cui bono", when talking about AGW. And who are the people, who want to believe that. My guess is, that a significant part of them would be people, who are against the LHC, claiming it'll devour the world. I'm - of course - prepared to support any reasonable evidence against non-AGW, but those are still pending. against non-AGW - denier .. I wouldn't use denier. It sounds like AGW is true, but those poor souls are refusing to acknowledge that. All I saw was an evidence (for non-AGW) of the scientists who study relevant areas (weather, climate), and on the other hand the consensus made by many "scientists" on the panel. Many of whom were actually physicists, chemists and even plain laymen, and business people (such as Al Gore). yes, there is lag between event and response, and a dampening effect on the influence because of the underlying mechanisms. Our temperature is regulated by the sun and our orbit around the sun, primarily; this cannot be debated in the least; these climate AGW morons are starting to get annoying when they turn around and say we are more responsible for how the environment is than the two major influences I just described. I dont believe them in the least because they beg for carbon taxes. Usually scammers say the sky is falling then beg for money. The Sun is stratified, covered with a surface veneer of hydrogen–the most lightweight of all elements–and centered on an energetic core of extreme nuclear density. The depth of this dense, energetic solar core shifts relative to the solar “surface” as gravitational forces cause the Sun to experience abrupt acceleration and deceleration in its orbit about the barycentre of the solar system. Apparently, Oliver has never heard of Galileo's gravity experiments. Heavy and light objects experience the same identical gravitational acceleration. You get an F in introductory science; go back to middle school. Cosmic ray flux is affected by the Sun's magnetosphere, not the Earth's. Earth's magnetic field is too small and weak to interfere with cosmic rays (it can barely buffer solar wind.) Cosmic rays do get deflected by the Sun's field and the plasma sheath at the heliopause, which both act over much greater distances. No statistically significant correlations were found between any of the four cloud parameters and galactic cosmic rays. Are the rainy weekends evidence for AGW or against it? If we extrapolate these short term perturbations to decades, we could get an interesting numbers about man-made activity. There is no hypothesis linking flares and global temperatures over anything other than brief periods. Sunspots and solar wind, however, are the principal climate drivers. Of course it is. I presume, the long period of solar inactivity slowed down the signs of global warming in recent decade. On the other hand, the man made global warming isn't out of the game, because both effects may be complementary or even synergetic. We should stop fossil fuel burning not (only) because of some global warming, though - but for to avoid nuclear wars for the rest of sources. The energetic crisis argument is independent to AWG arguments. I find it strange that there isn't much talk about methane. It may not be as abundant as C02, but it is 12 times stronger of a green house gas, yet not many consider it. A slight increase in temperature at certain regions of the ocean can release a lot of methane too. Al Gore's crap is just a big money scam to sap the population of what little wealth they have left, further widening the gap between the ultra rich and the ultra poor, it is part of the NWO agenda. But as with the above post by seneca, I too agree we need to get away from fossil fuel, but our current gov will NOT let us! I personally know a friend who had some break-through research using the "Tesla Switch" for free electrical power, he put on a public demonstration, 5 minutes after he got back to his shop, 3 government thugs came in, smashed his equipment, threw him against the wall, shoved 9mm's in his face and said "Don't you EVER show that again." Crime has been on the rise since 1950. Global temperatures have been on the rise since 1950. Does that mean that crime causes global warming? Of course not. I find it interesting that none of the AGW proponents ever come up with a sound theory on what caused all the nearly identical warming cycles that ocurred before the industrial age. You'ld think that would be important to the discussion, as well as a theory of what caused those cycles to turn about, which is even more important. A good many do Forest, typically they're AGW proponents but not on the order of our CO2 production but more our land use change, and I typically find myself in partial agreement with those researchers. Skeptic, maybe you could direct me to info on that. So here's my take on the current CO2 caused AGW theories. The current hype can be linked back to the Vostok ice-core samples as one of it's foundations. If you look closely at that data, you'll see that warming precedes the increase in CO2, not the other way around. That makes sense when you consider how much of our CO2 is sequestered in our oceans. Warming lowers the solubility, therefore causing the oceans to release CO2. Extending that, if CO2 had such an effect on warming, then this should be a runaway effect. More warmth, more CO2, therefore more warming and so on. Where's the theory that explains how this runaway effect has halted many times in earth's history? If man is really causing warming through CO2, this information would be critical, but I'm not hearing the discussion. You're correct in identifying one of the major feedback loops, with respect to out-gassing from oceans. However, you're missing one key aspect. The greenhouse effect of CO2 (and any other greenhouse gas) is logarithmic with respect to the gas concentration. Say you start out with 100 ppm of CO2, which produces 5 degrees of warming (just hypothetically speaking, for easy round numbers.) If you double it to 200 ppm, you'll have 10 degrees of warming. To produce 15 degrees of warming from there, you'd expect you'll need another 100ppm, for a total of 300 ppm? But no: you'd need to instead double again to 400 ppm. To get to 20 degrees (another incremental 5 degrees of warming), you'd need to double again, to 800 ppm. And so on. So eventually, the effect saturates: to produce ever more warming, the amount of CO2 in the atmosphere would have to grow exponentially. Probably the common cold, too. People can say whatever they want, but this is a 'published paper' that went before scientific review, the most solid of rebutals. The point in this paper that the 'solar cause' paper ignored trends is telling. Spotless days, or solar cycle length, correlate better than CO2 levels to lower temperatures. Solar activity has a cumulative, delayed effect, as it cools or warms the ocean. The solar activity of the 20th century is remarkablly lower than those in the 19th. This solarcycle is like the 19th century ones. If low activity persists for a few decades, it should be a great experiment to learn from. "So - you measured, the wavelength of light increases with gravity field? And you're still claiming, it's because of general relativity? Sorry, but are you really sure by it? Isn't it just a some coincidence? Correlation does not mean causation!" With such approach I could impeach ALL existing scientific theories easily. We have no other explanation for rainy weekends, then the absence of human activity. Nature "does know" anything about manmade weekend time period. You really need to stop speaking hypothetically. You are way, WAY off the mark. A jar closed to outside air, filled with CO2 at levels many times higher than in the atmosphere, and left in the sun for part of the day gives about a 2 degree increase over a jar filled with just atmospheric air and also closed. You can do the experiment yourself. You also can do it with a twist and get even more interesting results. Take a sample of atmospheric air. Then, collect a sample from inside a home. Next, collect a sample of air from a classroom. Make sure that you place a thermometer in each jar and that you sample levels of CO2 in each jar and close the jars immediately after collection and sampling, and record the results. Finally, place all labeled jars outside in the sun for several hours. Record the results from the thermometers. Ensure that at least one thermometer is placed near the jars to account for heating from the ground and correct from that. Pink_Elephant, you have just illustrated why AGW theory is wrong, and the most commonly promoted lie concerning the science. A doubling of CO2 does not result in a doubling of long wave radiation trapped, but a halving of the distance from the heat source from which it is trapped. 100% of the long wave radiation (heat) on the planet comes from shorter wave radiation reemitting a LW after striking the surface of the planet. There is virtually NO LW radiation coming from the Sun. Once one understands this simple principle, the AGW theory, and in fact the whole "Greenhouse Model" becomes absurd. If it can't pass the most simple test, then it is simply wrong. The "greenhouse" effect of CO2 is due not just to CO2 alone, but also to positive feedbacks (like water vapor.) The radiative forcing due to CO2 at current concentrations (not including feedbacks) is estimated at between 3 and 8.5 degrees C.
Your lack of understanding is breathtaking. The sun emits as a black-body, so it does indeed shine a lot of long-wave (IR) onto Earth. Its peak is in visible wavelengths, but that doesn't mean it only emits visible light. ALL solar radiation that strikes the surface of the Earth, and is absorbed, heats up the surface, which then re-radiates as a blackbody (at much lower temps), with the peak in the infrared. However, much more energy is lost by convective transfer through the atmosphere, than through direct radiation from the surface. The atmosphere ultimately sheds most of the heat radiatively, at the interface between the atmosphere and the vacuum of space. Radiative forcing of greenhouse gases plays a minor role in the lower atmosphere (where convection dominates), but a big role in the upper troposphere and above, where it provides a net addition to the initial solar radiative flux directed at lower atmosphere and the ground. Reference Freeman Dyson - an AGW denier. And a Great Man. He's smarter than all those crackers. @PinkElephant re your response to OKM's report in arxiv in stratification in the sun; You are NOT thinking very well! Is the Earth stratified? The moon?, Venus,? Mars? Jupiter? etc. Clearly and without question yes in all cases. Why is it difficult to believe the sun to be any different? OKM is on to something in his paper but like all the mainstream scientific belief systems it is difficult for unimaginative scientists to buy into (or even to just consider the evidence) anything that disrupts their beliefs or income stream (which is understandable). There IS something wrong with our understanding of how the sun and stars generate energy as there is with how that energy affects the climates on the planets and this article does little to shed any light on the latter only to confuses matters. Observation and correlation are not the same. All scientists know this. It's obvious that you're not a scientist. @PinkElephant again:What you don't seem to understand re CO2 absorption of IR is that at ca. 280 ppm CO2 the absorption bands are about 95% saturated and warm the Earth by your 8.5 deg C. Lets call it 20 deg C for simplicity and generosity. Doubling the CO2 to 560 ppm will increase the absorption by 1/2 the remaining 5%. So, 1/2 x 5% x 20 deg C = 0.5 deg C. INSIGNIFICANT! Double it again to 1120 ppm, an additional warming of 0.25 deg C could occur. CO2 DOES contribute to keeping the earth warm and livable but the vast majority of it's contribution all happens below ca. 300 ppm! This is how science works. No diddling of the data or obfuscations are necessary. Nice citations. Wrong, but nice. See, that is a citation. Radiative forcing from CO2 is calculated at 13%. You are NOT thinking very well! Is the Earth stratified? That wasn't the point. Oliver was claiming that the heavier core of the sun would experience a different gravitational acceleration (due to influence from orbiting planets) than the sun's supposedly thin atmosphere. All masses experience the same gravitational acceleration. That's not even Newtonian -- it's basic Galilean physics, that he fails so spectacularly. Never mind that the Sun, with its known radius, would have been much heavier if it were composed mostly of heavy elements. The mass of the Sun is well-known, and given its known diameter, there's thus a hard constraint on its potential heavy element content. Moreover, if the Sun was mostly built from heavy elements, there would be a lot more rocky material left over in the inner solar system. The terrestrial planets would be the super-giants, not the outer gas planets. Oliver fails so badly, on so many levels, it's glaringly obvious he's a crank. The saturation 'argument' is a string of misconceptions, built on a foundation of bad science. Sun responsible for Europe's colder winters. When the Sun's magnetic output is low, winters in Europe tend to be cooler than average - whereas higher output corresponds to warmer winters. Note that my above post [Seneca - Apr 07, 2010] got nine negative points. Are you all trolls, or what? What did you upset so much on this post? I'll guess that Apr 07 post of yours got such low ratings, because it was rather a bit off-topic, and included some rather wacky speculation. Anyway, regarding your last post and link, it only links solar activity with winters in England and nearby European landmass (attributing this to a supposed wiggle in the jetstream across the north Atlantic.) Thus, discussing a mere regional effect, not global temperature as is the subject of the article above. I see all these diagrams of radiation flux coming in and radiation going out at longer black body wave length - and it reminds me of the old water cycle. Water evaporates, is carried aloft, condenses and comes down as rain. How many BTU's is the water cycle pumping up to altitude compared to photon radiation? Or is this totally irrelevant to Al Gore making yet another fortune off Cap and Trade? You're right, this model has even its cosmological connotations. The matter/energy circulates inside of our Universe. ..coriolis force is important for rotating spherical bodies .. The eleven years cycle of solar activity is apparently related to eleven years of orbital time of Jupiter. We know, due the Jupiter the center of mass/gravity of solar system is shifted outside of Sun surface, which contains plasma fluid. The rest is just a common physics of fluid rotation along center of gravity. You should become more familiar with it to see connections. Regading predictions of climate changes related to pattern of solar activity I'd reccomend this introduction into subject. Hottest March and hottest Jan-Feb-March on global temperature record. The record temperatures we’re seeing now are especially impressive because we’ve been in "the deepest solar minimum in nearly a century." I'm afraid, if solar cycle will restart, we'll experience hell on the Earth..
To sum it up low solar activity = increased 'blocking' of jet streams = more cold winters in Europe. Global temperatures are continuing to rise and this year, barring a major volcanic eruption or asteroid strike, will be the warmest on record. Periods of low sunspot activity are associated with changes in the winds that tear though the upper atmosphere, bringing unusually cold winters to northern Europe, a new study finds. Interesting post from the BBC and one that supports the overwhelming evidence that Mann was correct in showing that the so called Little Ice Age was a regional phenomena. Your summary is incorrect, and it appears you didn't comprehend the article. Low sunspot activity produces a colder Europe and has nothing to do with the MWP in any way, shape or form other than what you fabricated during your leap of logic. "Blocking" creates abnormal cold and has nothing to do with abnormal warmth, jsut the distribution of warmth from North Africa. If anything, the article you linked would be detrimental to your case of the MWP being localized to Europe and the Jet stream would have to be unblocked for the warmth to be brought in from Africa. Now let's find out what they discover over the summer, then you may have an actual point, but I doubt it, seeing as the MWP has been correlated in other locations on the globe. But that effect is not evidenced in the above article and is pure speculation. The above speaks to why Europe gets cold snaps. The mechanic for abnormal heat could be entirely different. The above study makes allusion to that in its last few lines. "Now we'll see what the summer brings"
"SUPPOSEDLY controversial theory of human-induced global warming? (emphasis added)" How about a little intellectual honesty on your part?! Oops. Another excuse why their theory isn't proven out -- again! It may have affected Europe more but the signal of the LIA can be seen in other proxies such as Vostok, New Zealand, Tasmania, and so forth. No matter how much Mann tries to confine the LIA and MWP to Europe, the only way he can make it work is by manipulating the data to hide the signal. PE, the jar experiments are meaningless or meaningful in the eye of the beholder. Check back above, there are controls in the above version of the jar experiment. It is a simple matter to remove the increased heating in the jars caused by direct sunlight and lack of convection thereby. It is impossible to create the kind of convection in a lab that occurs in nature. I acknowledge that. But, do the experiment and see the results for yourself. Whether you do the experiment or not, your numbers are way off regarding CO2 and its alleged effect. Even the IPCC's numbers are known to be exaggerations. I suspect that you are getting your information from them or some related source. but maybe not - solar minimum caused the cooling of atmosphere, but the temperature of ocean is still raising. It looks like something is heating it from bottom up. Did you remember the disaster 2012 movie? Who invented its stuff with neutrinos, exactly? That has all been completely and soundly refuted. Haha, yah, the neutrinos MUTATED into an entirely new variety called Algorium! I'm not completelly sure about it. For example, the increased earthquakes frequency was soundly refuted at many places, too. Now we can see, even much older works observed it! And there are another indicias - the reversal of geomagnetic poles, the signs of global warming over whole solar system, etc... IMO solar system is passing through massive cloud of dark matter of gravity field of large invisible yet object. Such object could manifest by increased concentration of neutrinos, axions and another particles of dark matter. It would literally make vacuum more dense. How such change would manifest for us? Well, many ways. The increased vacuum density would dissolve material particles in increased way into radiation. And the speed of decay of radioactive elements in Earth core would accelerate as well. We can say, the neutrinos of dark matter catalyze radioactive decay. And this decay is the main source of geothermal heat. The increasing of vacuum density cannot be observed easily, because it's slowing down both clock speed, both light speed at the same moment. Well - at the case, if we are using the light (laser interferometry in particular) for measurement of both time, both space intervals. Currently we are doing so, because of system SI units. But we still have old iridium meter and kilogram prototypes. These prototypes aren't dependent on the light speed in vacuum so much. The point is, when matter get into dense vacuum, it expands slightly. And this expansion could be observed by comparison of laser meter prototype and iridium meter prototype. And kilogram prototype would lost its mass, when compared with younger copies of it. For example, the increased earthquakes frequency was soundly refuted at many places, too. Now we can see, even much older works observed it! The older works would be what was refuted. It's called expansion of measurement principle. For example, there were no such things as galaxies 100 years ago. Then we found 1, then we started finding hundreds, now we find thousands. Does that mean that the number of galaxies is increasing? No, it means we didn't observe them prior. But this particular work wasn't quoted/cited in such refusals. It's irrelevance is just an ad-hoced conjecture of yours. I've publication, you have nothing. And I caught you openly lying many times here. Why I should believe just you? Such stance would have no sense. 4) observed heating of oceans "from bottom-up"
All these phenomena have the same sign supporting my hypothesis. Now you can start to collect examples of counter evidence with the opposite sign. Go ahead - and remember: experiment/observation always goes first. And broglia doesn't have a clue what fuzzy logic means, which is another indication that he/she/it isn't a real scientist. I also was provided proof that broglia is just seneca under a different name, a sad pathetic individual with a growing desire for attention and no real scientific merit. You're just an anonym, whose only pleasure is to abuse voting system. I'm sorry, which account of yours is that a shot of? I get so confused between your 18 posting personas that I can't keep track anymore. I'm quite sure JayK is in the same boat. Pseudoscience is NOT physics. Aether theory is just the physics world's homeopathy, a collection of pseudoscience stories dressed up in language meant to make it sound legitimate. When you're actually ready to discuss physics instead of a debunked theory, seneca, then sure, go right ahead. For now, though, you're still just a copy/paste robot without the skill to know how to cite sources. Except 3 detrators immediately came to the forefront and showed the errors in his accounting for eccentricity in the radius of the sun as well as in the orbits of solar bodies. Secondly, the laser ranging data he used does not conform to the standards of long term measurement. I've read that paper many a time, it's wraught with inaccuracies and borders on pseudoscience, hence why it has not been accredited in further research to date. @SH: Can you link any of that, please? I tried to look up what seneca was blathering about, but all I found was a bunch of pseudoscience sites that tried to hide under a guise of legitimacy. You know, the sites that seneca posts on when she's talking to herself all the time. Unfortunately none of it is free and I won't violate copyright/publishing laws. This is how "conspiration" works in real life: evidences of many facts are systematically covered by various people - but when we go for details, we will find, these people aren't jewish masoners and leaders of society, but quite anonymous & incompetent trolls like retired teachers, free-lance programmers and similar people, who actually have no objective reason for such fight - their negativism just follows from their personal frustration. who actually have no objective reason for such fight - their negativism just follows from their personal frustration. I often find myself frustrated when faced with a multinamed jackass attempting to spread disinformation for what appears to be personal popularity and a need for acceptance by mainstream scholars who actually put the time and effort into understanding that which they discuss. .. to spread disinformation for what appears to be personal popularity.. I most assuredly do not need any assistance from you, especially within the realms in which I operate seeing as it's scientific and not pseudo-scientific in nature. If I ever need to get a screen name popular on the crystallinks.tripod.com crowd's radar, you'll be the first one I call. Isn't there something PhysOrg will do against sockpuppetry? I thought that was against the rules, and here we have broglia and alizee, who are proven aliases of seneca, attacking someone. seneca is an attention-seeker. You give it a fix every time you either respond to it or discuss it, as I am doing even now. Think of seneca as the cricket in the wall. You can drive yourself nuts and tear your house apart trying to stop the noise, or you can just ignore it, whereupon it will quickly fade from your awareness. PhysOrg is a big place... if seneca can't coax a response out of somebody here within a day or so, it will seek greener pastures. Like Dachpyarvile and ......Skeptic Heretic??? Don't you mean, "Like JayK and ......Dachpyarviie??? "?